Kiosk, a pioneer of Iran's underground music movement, presents a compilation of new songs and old favorites, recorded live at the legendary jazz club, Yoshi's of San Francisco. 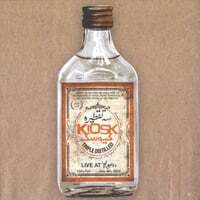 Pioneers of Iran's underground music movement, Kiosk is praised for its sharp and satirical lyrics as well as its unique blend of musical styles, from rock to gypsy jazz to Iranian folk. Their fourth album, "Triple Distilled," is a compilation of new songs and old favorites, including covers of songs by Tom Waits and the unforgettable Fereydoun Farrokhzad. Kiosk has added a new dimension to their sound with this album, by incorporating gypsy-style violin, accordion, and clarinet. "Triple Distilled" features notable guest jazz musicians and was recorded live at the legendary jazz club, Yoshi's of San Francisco, making it what is likely to be the first live album in this genre since the Islamic Revolution of 1979. The sound is hauntingly beautiful, accompanied by the lyrics that envoke feelings of seperation. I like all their works, but this one is their best. Fantastic work. This probably is the best Iranian band live performance I have ever heard and the songs are beautifully played and arranged.